Sonoma County’s working lands produce not only foods, fiber, and fuels, but also can create widespread benefits to our environment and our economy. With a wide swath of local partnership and initiatives focused on sustainability, the RCD works to support Sonoma County’s agricultural industry as one of the most progressive in the world. LandSmart® is a regional collaborative program that helps land managers meet their natural resource management goals while supporting productive lands and thriving streams. 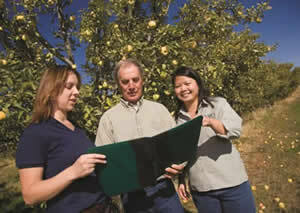 LandSmart® Plans are prepared with you and are geared to meet your needs. LandSmart Plans describe the natural and agricultural resources of your property, document the practices that you use to protect natural resources, identify opportunities to maintain or improve the quality of natural resources on your property, and prioritize management practices according to your needs, goals, and timelines. As in most of California, water is a valuable commodity in Sonoma County. Alternatives to groundwater sourcing, improving and creating water storage, transitioning from water to wind frost protection and improving water use efficiency are all ways the RCD can support farmers in their effort to conserve water on their farm or ranch. When natural vegetation is cleared and when farmland is ploughed, the exposed topsoil is often blown away by wind or washed away by rain. 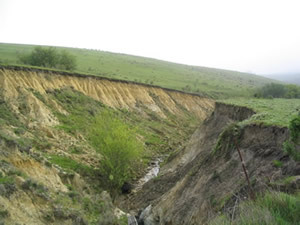 Rain and natural forces can also create larger erosion issues. When soil erosion occurs, farms lose valuable topsoil. Soil carried off in rain or irrigation water can also lead to sedimentation of rivers, lakes and coastal areas. The problem is exacerbated if there is no vegetation left along the banks of rivers andother watercoursesto hold the soil. Sedimentation causes serious damageto freshwater and marine habitats, as well as the local communities that depend on these habitats. Recent food safety practices have created even more challenges to managing erosion. The RCD offers assistance with managing soil, controlling erosion, and now also rents a non-tillage drill to seed without disrupting soil. Plant nutrients are essential for crop production. When applied in proper quantities and at appropriate times, nutrients (especially nitrogen, phosphorus, and potassium) help achieve optimum crop yields. 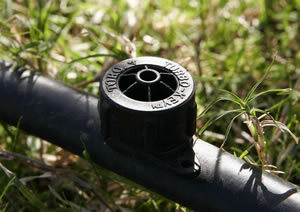 However, improper application of nutrients can cause water quality problems both locally and downstream. 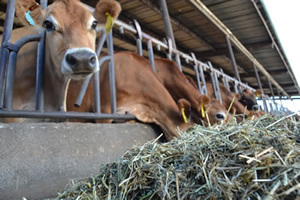 Over application of nutrients can also create unnecessary costs for farmers. The RCD has programs and services for farmers needing financial or technical assistance withnutrient management practices on their farms. The RCD and its LandSmart® partners are working to develop a carbon planning component to the comprehensive conservation plans developed through the LandSmart® program, identifying practices that would allow agricultural operations to increase carbon sequestration and reduce greenhouse gas emissions. These practices would provide multiple benefits for climate change resiliency, by reducing atmospheric CO2 levels while improving soil health, water holding capacity, and crop and forage production. Practices also promote water conservation and reduce irrigation needs, reducing stream withdrawals and thereby enhancing water quality and instream habitat. Finally, practices such as hedgerows and windbreaks work to both sequester CO2 while enhancing on-farm wildlife and pollinator habitat. 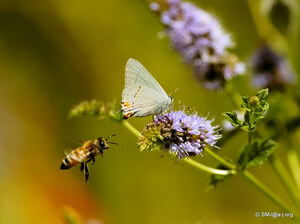 Pollinators are essential to our environment and the productivity of local farms. The ecological service they provide is necessary for the reproduction of nearly 70 percent of the world’s flowering plants, including more than two-thirds of the world’s crop species. The RCD has partnered with farmers in funding and planting pollinator-attracting landscapes.